Although these are challenging times for farmers, an Iowa State University Extension specialist will deliver a message of hope when he gives a series of crop-marketing presentations in South Dakota beginning Nov. 26. Steve Johnson, a farm management specialist, will advise farmers how to focus on controllable factors. He’ll discuss cost control and cash flow management, use of risk management tools, growth of farm operations and development of crop marketing plans. This will be Johnson’s 16th year of making presentations in the GrowingOn program organized by Farm Credit Services of America and South Dakota Corn. There will be presentations in Watertown, Aberdeen, Huron, Mitchell, Yankton and Sioux Falls. Johnson’s presentation will include five case studies using actual farming operations in South Dakota, Iowa and Nebraska. Johnson says those real-life examples provide valuable information because they show how farms are achieving success. There’s a heavy focus on cost of production, marketing in the spring with revenue protection and how to determine cash flow needs in the winter. The case studies are based around the strategies being used by five farmers who raise both corn and soybeans. And although they live in different regions, the farmers are using similar tools and strategies, and doing it successfully. Johnson will emphasize that pre-harvest marketing has been the right thing to do for the past six years. He says farmers have to be marketing early. When looking at break-evens for farmers, land costs are probably the biggest issue. His advice to farmers who anticipate they’ll deliver significant amounts of wet or damaged corn or soybeans is to work closely with their merchandiser in advance about the specifics of their dried weight calculations and damage discounts. Johnson also will discuss the use of crop insurance. 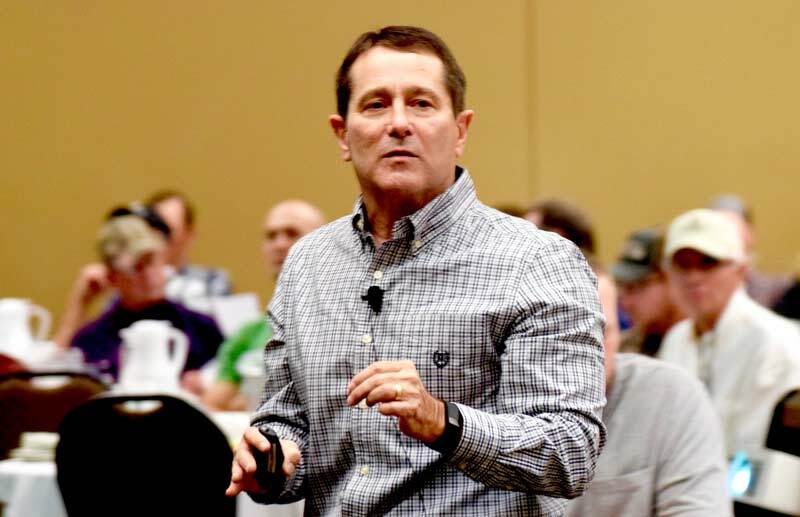 Troy Knecht, president of the South Dakota Corn Growers Association, says the GrowingOn presentations always draw big crowds, and Johnson provides a wealth of useful information. Despite a sluggish ag economy, Johnson says there are reasons to be hopeful. The global population is growing, which increases the demand for food. Global incomes also are improving, increasing the demand for feed grains, biofuels, oilseeds and animal protein. Also, the overall U.S. economy is growing. At the GrowingOn presentations, he’ll share his message of hope. Times will be announced later.